So, are you confused in choosing between Samsung WB350F and Samsung WB380F? Well, these two products have also caused some confusion among other potential buyers. Indeed, the matter of fact is that the two products share a lot of similarities not only in the looks but also in the specifications and features. So, is there any difference between Samsung WB350F and Samsung WB380F? Which is the one that you should choose? Let’s find out below! In terms of design, Samsung WB350F and Samsung WB380F are indeed identical. They come in a compact and lightweight metallic construction. Each available in several color choices, the surface of the digital camera is textured, promoting enhanced handling that won’t let your digital camera slip away from your hands. On the front side of each model, you can find a Samsung zoom lens. On the rear, there is a 3.0-inch TFT LCD touchscreen with high resolution and smart, intuitive control. There are also function buttons and dial control. So, you can say that they have a hybrid control scheme. This is very convenient. You can still have the quick and straightforward effectiveness of dial control, while making use of the responsive touchscreen for adjusting the camera focus. Both Samsung WB350F and Samsung WB380F are utilizing a 16.3 MP BSI CMOS image sensor. Their image quality is excellent. They are able to capture sharp and detailed images very well. The colors are full and solid, though obviously not to be compared to the pricier mirrorless or DSLR cameras. Still, the image quality is satisfying. Great for casual and documentary purposes, decent for beginner photographers. Both are able to capture still images in a maximum resolution of 4608 x 3456. For video recording, they can record in up to 1080p Full HD quality. Samsung WB350F and Samsung WB380F also come with similar lenses. They each utilizes a 4.1–86.1mm F2.8–F5.9 lens capable of providing up to 21X optical zoom. This is very valuable, as it allows you to shoot a photo object from a far distance, such as when you shoot a sports event or taking a picture of the wildlife. Both have built-in Wi-Fi and NFC. Samsung WB380F comes with a few additional features, though. It now has a self-timer feature with 2-sec and 10-sec countdown options. In addition, it has also implemented a continuous shooting mode with 3fps and 7.1fps burst speed choices. - Captures detailed images up to 4608 x 3456 pixels resolution. As you can see, there aren’t many variations from Samsung WB350F to Samsung WB380F. 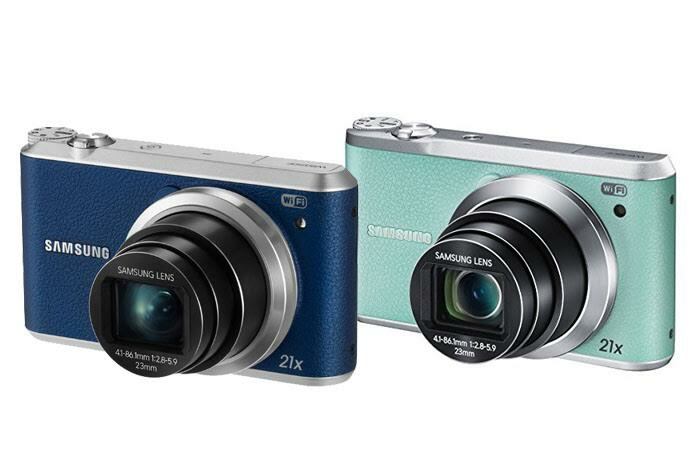 However, you can choose Samsung WB380F for the self-timer and photo burst features.